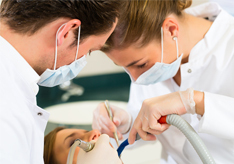 Hearing protection for dentists, dental assistants, and dental hygienists is critically important. High-speed dental drills, ultrasonic cleaners, and high speed turbine hand pieces are just a few potential hearing hazards. This essential dental lab machinery can cause serious hearing damage and even tinnitus. Even when very loud noise only occurs intermittently, a small dose of hazardous noise still causes a small amount of hearing damage -- and that damage is cumulative and irreversible. Far too often, dental professionals do not notice how this gradual noise-induced hearing loss is affecting them until it is too late. Fortunately, ear plugs present many excellent solutions for dentist hearing protection. The Right Amount of Noise Blocking: Noise blocking is certainly called for, but don't overdo it. Even an NRR 5 ear plug can help take the edge off hazardous noise and stave off a considerable amount of hearing damage over the years. Additionally, noise blocking specifically in the high frequency range is most critical for dentists. Natural Sound Hearing: The best ear plugs for dentists must provide the ability for the dentist to clearly hear and converse with the patient. Natural sound hearing ear plugs provide that capability: the ear plugs do not need to be removed to hold a normal conversation. Most natural sound ear plugs are geared toward musicians, but they also tend to offer the right amount of noise attenuation and natural sound hearing to make them an ideal choice for dentist ear plugs. Discreet Appearance: Obviously wearing ear plugs around the office may be an unappealing prospect for many dental professionals. The dentist ear plugs listed here have all been chosen because they offer the right amount of noise blocking, because they allow natural hearing and conversation, and because they feature a low-profile fit. The products listed below all offer these important features for dental professionals seeking hearing protection. We also offer an electronic ear plug, the HD-15, which offers the capability to switch freely between a hearing protection mode and a sound amplification mode: an excellent option for dental professionals who already suffer from some degree of hearing loss. (NRR 12) WR20 acoustic filters provide an average of 20 dB of noise reduction and an NRR of 12, making TRU Recreation ear plugs a great choice for concerts, clubs, airline travel and motorcycling, as well as many other activities in which you need to be able to hear clearly, but where the volume is too high to listen comfortably. (NRR 2-16) Westone TRU™ Universal Fit Professional Musician ear plugs let you enjoy high quality sound without the hassle of getting full custom musician ear plugs, but let you upgrade if you decide you want to later on. The filters are interchangeable and additional filters can also be purchased separately if you need them. A specialized hearing protection solution is now finally available for dentists and hygienists. These plugs help take the edge off hazardous drill noise, and they allow for clear conversation with patients without the need to remove the ear plugs. Extremely discreet and low-profile. (NRR 10) Crescendo Vocals is part of the elite Crescendo line of natural sound musician's ear plugs. Crescendo Vocals plugs are especially tuned and attenuated for vocalists, and they work well for all moderately loud venues. Perfect for pop concerts and rock shows. Discount pricing is available for orders of 10 or more pairs. Please email info@earplugstore.com for pricing. (NRR 12) Crescendo Music ear plugs are all-purpose natural sound musician's ear plugs. Unlike the other Crescendo musicians plugs, the Music model is not tuned to a specific type of music; instead, the Crescendo Music is a great and affordable choice for all styles of music. Discount pricing is available for orders of 10 or more pairs. Please email info@earplugstore.com for pricing. (NRR 8/11/16) Clearly hear music or voices without distortion while protecting your hearing. Each set includes three interchangeable sets of acoustic filters and a sturdy carry case. (NRR 11/16) Alpine MusicSafe Classic Natural Sound ear plugs offer two sets of interchangeable acoustic filters that let you hear naturally, while you adjust the level of attenuation based on whether you need more or less protection. (NRR 9) Killnoise Earplugs for Music and Noise block only dangerous and damaging noises, while letting through the sounds one wants to hear. Ideal for performing live music, attending concerts, going clubbing, travel, and daily wear by those with sound sensitivity. (NRR 19) MusicMinders™ Music Lover's Ear Plugs feature the unique Hocks Noise Braker® filters that protect your hearing while still letting you clearly hear voices and all the music, but without the distortion you get with ordinary earplugs. (NRR 12) Features breakthrough natural sound technology with acoustic filters that reduce the volume of sound, with minimal distortion. With Mack's Hear Plugs, you will be able to hear and understand people speaking with you even in noisy venues.